Laurie and Steve Wilson win their first MMBC tournament. It is also the first tournament with the club. Impressive you guys! Congratulations and great job! Stillhouse Hollow Tournament – Team Parish / Killough win two in a row!! 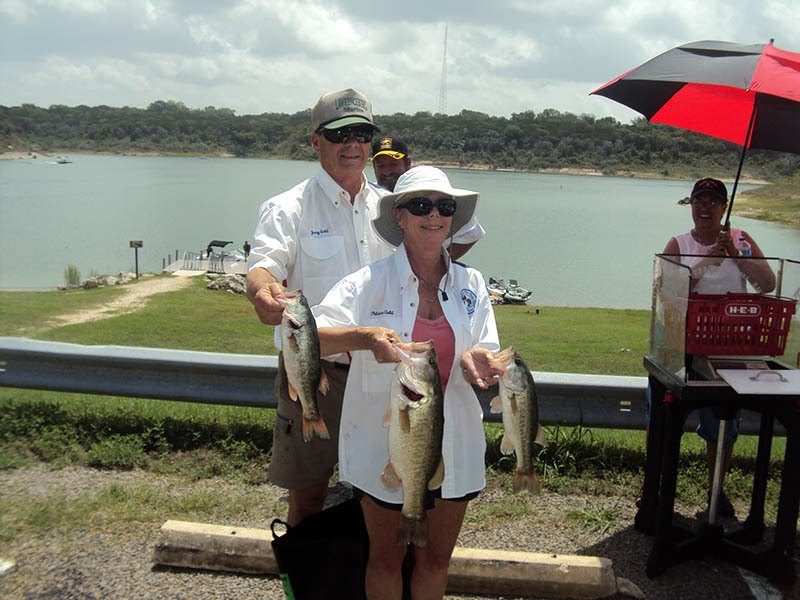 Stillhouse Hollow Tournament Results – The Mr. and Mrs. Bass Club of Austin held its eighth tournament of the year on the crystal clear and apparently fish barren waters of Stillhouse Hollow. Only four of the twelve teams competing managed to bring fish to the scales. Eight teams had zero fish to weigh in. Talk about a greedy lake! As our pre-tournament poll predicted, one team did manage to catch a limit. That team was Leslie Killough and Brent Parish. They brought five fish to the scales weighing 8.33 lbs. Leslie also took Women’s big bass honors with a 1.97 pound largemouth. Once again, Leslie narrowly beat Marilyn Connell’s 1.92 lb bass. Speaking of the Connell’s, they took second place honors two tournaments in a row. This time with two fish weighing 3.40 lbs. 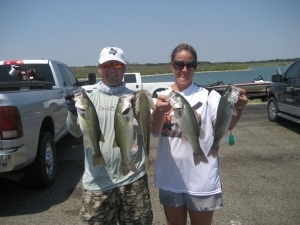 In third place, with one fish, and also with men’s big bass of 2.42 pounds, was the team of Jesse and Gina Martinez. Team Davis was the last team that was able to catch a keeper for weigh-in which landed them in fourth place. We knew it was going to be a tough tournament ahead of time due to the poor reports we found online. I think a lot of anglers were surprised when they didn’t manage to bring a single keeper to weigh in. From our findings, the five keepers we caught were all in 22-27 feet of water. That’s really deep! We caught them on on Strike King XD6 and Norman DD22 crank baits (8 lb test) and carolina rigged flukes and lizards. 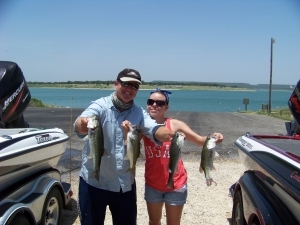 Next month the Mr. and Mrs. Bass Club of Austin will be heading to Lake Belton for our September tournament. If history repeats itself, as it often does, this will also be a tough fishing tournament. Good luck everyone. The Year to Date Lake Summary Charts page has also been updated. 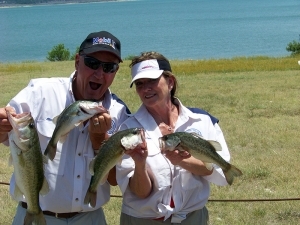 The Mr. and Mrs. Bass Club of Austin marked the middle of the 2011 season with a tournament on Lake Stillhouse Hollow. We started at 6:00am on Saturday June 11th and ended the day a noon due to the scorching heat we have been enduring across Texas this year. It seems that most of the anglers could have used some more time on the water since only one limit of bass was weighed in by the winners Glenda and Allen Summers. They managed to land over five Stillhouse Hollow keepers and their best five tipped the scale at 8.37 pounds. Allen caught a nice 2.79 pounder to anchor their winning sack of bass. In second place with only two fish was Leslie Killough and Brent Parish with their two fish weighing 4.13 pounds. Brent caught a 2.94 lb bass to take men’s big bass honors. In third place with two fish weighing 2.60 pounds was the team of Brenda and Cliff Davis. 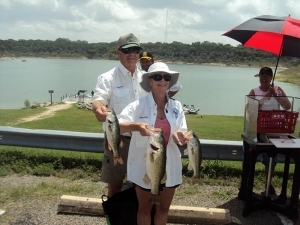 Brenda caught women’s big bass of the tournament which weighed 1.41 pounds. Next month we will be fishing on Lake Austin at night where our chances of landing some much larger bass are much greater. Although the grass is coming back nicely on Stillhouse the fishing just isn’t back to what it was a couple years ago. Recently it seems that the “good old days” of excellent bass fishing on Stillhouse Hollow have become a thing of the past. Come to think of it, it seems that the bass fishing has been extremely tough on all the lakes we have visited lately. I don’t think the fish have gotten any smarter, nor do I believe we as anglers have digressed. I guess the summer’s heat is just too much for fish and anglers alike. 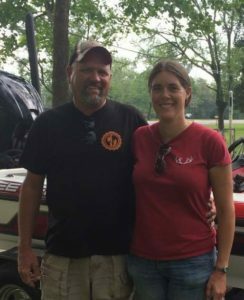 Despite knowing this, eight determined MMBC teams showed up to fish the seventh Mr. and Mrs. Bass Club tournament of the year on July 10th. The tournament began at 4am in the cool of the night and weigh in was held at the marina at noon. The tournament started out with some eerie early morning fog blanketing the lake. The winds were light and the water temperature started out around 82 degrees and climbed to 86 degrees by weigh in time. On a side note, one thing that made me excited as I fished (not caught) was the amount of hydrilla I saw floating in the lake. Something I hadn’t seen in a while on Stillhouse. I also ran across several nice bunches of it growing in the 16-20 foot range at various spots around the lake. Then I ran across it on a shallow flat I was fishing in about 3 to 4 foot of water. Our only keeper bass of the day came from the shallow hydrilla. I am optimistic that if the hydrilla continues to grow we can expect great things from Stillhouse again. On this day the MMBC anglers were not blessed with great fishing and after talking to several folks at the ramp, it seems nobody is catching good numbers of bass on Stillhouse this year. I even heard rumors of fishing guides refusing to take clients to this lake because it been so tough to catch fish. With that being said, you can guess that the results I am about to write about are less than spectacular. However one team prevailed through the adversity and won their second tournament in a row during a time when putting a keeper in the livewell is harder than staying cool on a 100 degree day. Pat and Jerry Gold caught the most keepers on this day. Unfortunately for everyone else, it was only three bass weighing 6.79 pounds. This was still plenty to gain them first place accolades. I heard at the ramp that Pat caught all the fish that day. Way to go Pat! She also took woman’s big bass honors with a nice 4.17 pounder. It looks to me like the Gold’s new Bullet boat is treating them right! Congrats yall! In second place was Jessie Sanchez and his guest Dan. They brought two fish to the scales weighing 4.27 pounds and Jessie took men’s big bass honors with a nice 3.03 pounder. Rounding out the top three by just a few ounces was Lesli and Robert Brown, with two fish weighing 4.17 pounds. We now set our sights on Austin’s own Lake Travis for our tournament scheduled on August 21st. Until then, tight lines and be safe.